Since 1949, Seegars Fence Company has delivered superior quality wood, ornamental aluminum, chain-link, vinyl fencing and installation to homeowners, businesses, universities, power companies, and local governments. Seegars Fence Company: Demand The Best. Seegars Fence Company’s Durham serves The Triangle including Durham, Chapel Hill, Carrboro, Mebane, and Pittsboro! When you call Seegars, you can feel confident that you’ll experience only the very best in quality, value, and service. From the moment you first call us to the last day of your fence installation, our Durham, NC fencing team will help design and create a fencing solution that not only protects your home or business but also looks beautiful and lasts for years to come. 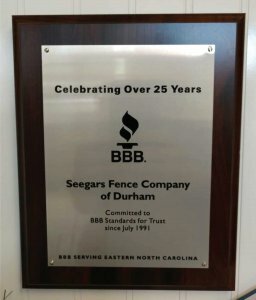 Seegars Fence Company proudly delivers a variety of fence products and services for homeowners and business owners in Durham and surrounding areas, including ornamental aluminum fencing, wood fencing, vinyl fencing, chain link fencing, custom hand rails, custom gates, farm & ranch fencing, privacy fencing, fence repair and more. To speak with a team member at our Durham fencing location, please call us at (919) 489-5303 or fill out our quick request form for a free service quote — we’ll be in touch with you shortly to confirm your request and schedule an appointment. Browse our Durham-area fence work in the gallery below, and be sure to include any image that inspires you when you fill out the form to the right. 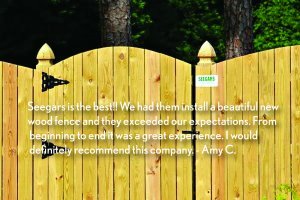 All of us at Seegars Fence Company look forward to working with you! Seegars Fence Company Serves Raleigh, Fuquay-Varina, Wake Forest, Durham, Chapel Hill, Carrboro, Mebane, Cary, Apex, and Pittsboro from 3 Conveniently located Triangle offices.